For most of the region’s history, expatriates had dominated the GCC region’s job market; however, this started to change lately as the GCC countries are increasingly shifting towards jobs’ localization. A most notable form of this movement took place in Saudi Arabia in the form of the Saudization policy, also known as Nitaqat system. Almost two-thirds of the Saudi Arabian population (65%) are from the working age population; however, the percentage represented by Saudi nationals in the workforce of the kingdom’s private sector never exceeded the 50% mark. Unlike what many people might think, the call for Saudization is not that recent. While it gained more significant prominence and popularity in the wake of the oil prices crisis in the recent years, the call has actually been there since the 1980s with its main purpose being combatting and reducing the unemployment rate of the Saudi Arabian young citizens. However, the scheme’s numerical goals have been the subject of multiple negotiations over the years until its actual implementation in 2011; through Nitaqat, the Saudi government seeks to generate 450,000 new job opportunities for the young Saudi citizens by the year 2020. 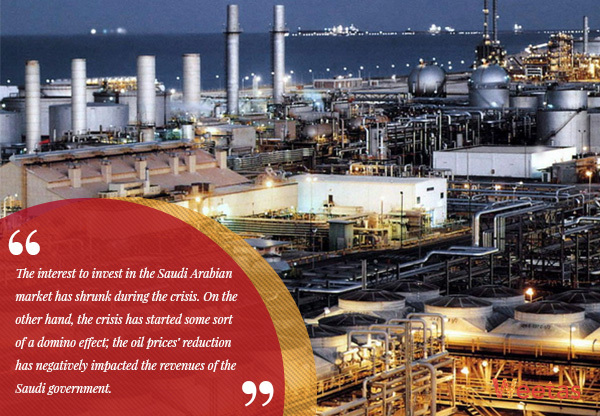 Unfortunately, the major downfall that took place in the prices of crude oil– the backbone of the Saudi Arabian economy and its main point of attraction for investments – starting from 2014 has made the goals of Nitaqat both harder and more urgent to achieve in the same time. On one hand, the interest to invest in the Saudi Arabian market has shrunk during the crisis. On the other hand, the crisis has started some sort of a domino effect; the oil prices’ reduction has negatively impacted the revenues of the Saudi government. This, in turn, forced the government to reduce its expenditures and subsidies, and impose new taxes for the first time in its history to cope with the new situation. As a result of that, the Saudi nationals’ purchasing power has been significantly diminished. The relatively high unemployment rate of the young Saudis further amplified this effect. Needless to say, the shock wave resounded through the other industries and sectors of the Saudi economy; therefore, the urgency of the call for Saudization has soared up in the past few years. While we can argue that such a movement and scheme does have the potential to refurbish the Saudi socioeconomic landscape, a lot of experts were concerned about Nitaqat’s possible side effects – at least on the short term. We cannot talk about the fluctuating status of the Saudi Arabian real estate market in the last few years without addressing what drives its two main forces: demand and supply. While the weakened Saudis’ purchasing power has significantly impacted the level of demand in the property market, it was not the only factor directly responsible for the recent downfall of the industry which is considered the second most powerful economic sector in Saudi Arabia right after petroleum and oil industries. There is also the other side of the equation, which is the market supply level. To be clear, we are not saying that the overall property market supply has proven to be insufficient; but while there was an oversupply of villas and luxurious units, the case was quite the contrary for the units suitable for the Saudi Arabian low- and middle-income households and individuals. To learn more, read through the following link our analysis of the Saudi Arabian real estate in 2018. That being said, there is another major sector that affected the demand in the kingdom’s real estate market as much as – if not more than – the Saudi nationals did, and that is the expats themselves whom the Saudization scheme directly impacted. 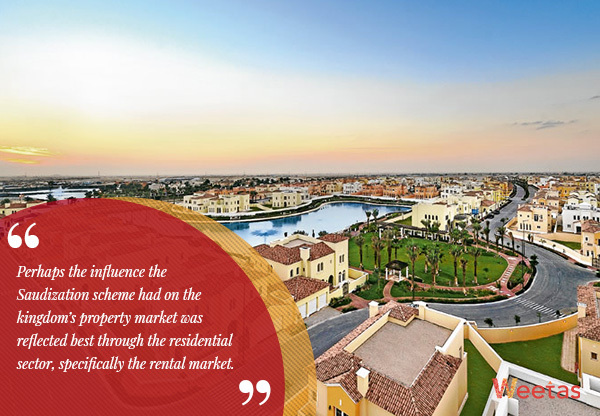 Perhaps the influence the Saudization scheme had on the kingdom’s property market was reflected best through the residential sector, specifically the rental market. The number of expats, the focus target of the properties’ rental market, is expected to fall by 40% by 2020. During the first quarter of 2018, according to the Saudi General Authority of Statistics, 234,000 expats have left Saudi Arabia; in 2017, 466,000 expats have left over the year. This shows that expats are not only leaving in large numbers, but their rate of departure is also increasing over time. To put that in context, the expats, by the end of 2017, were occupying 1.7 million residential units and that number is expected to decrease to be around 1.05 million occupied residential units in 2020. As per a report issued by Bussma, a Saudi-based real estate development company, this will reduce the property prices by 15 – 20%. 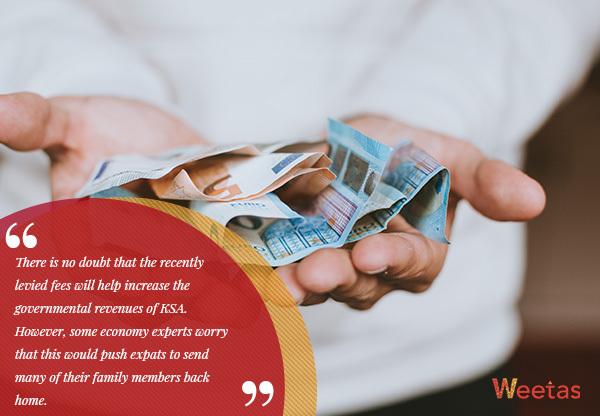 Another factor that continues to exert pressure on the working expats in Saudi Arabia is the Expat Dependent fee; imposed in 2017, this fee obliges working expats to pay additional fees for each dependent or companion they have. Starting from July 1, 2018, each expat will need to pay SAR2,400 annually for each of his companions. This marks a 100% increase in the fees that were only SAR1,200 in 2017, and this number will increase again to SAR4,800 (SAR400 per month) by 2020. The levied fees aim at generating SAR65bn by the end of 2020. This will naturally force some of the expats to send some or all of their family members back home; such an outflow of both people and capital will, at least on the short term, negatively impact the demand of the real estate market, especially for the bigger units that suit families. 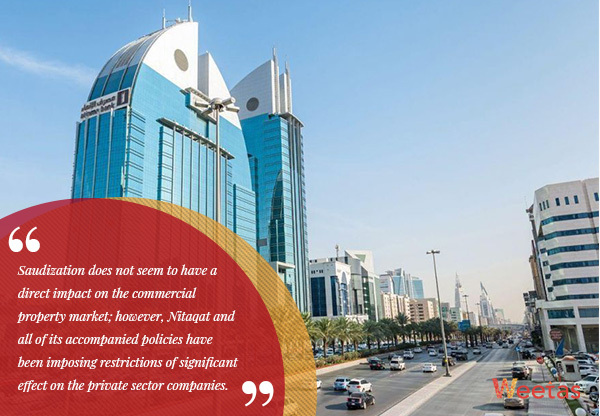 Saudization does not seem to have a direct impact on the commercial property market; however, Nitaqat and all of its accompanied policies have been imposing restrictions of significant effect on the private sector companies. Nitaqat’s policies oblige the companies to minimize the percentage of expats they hire and recruit the Saudi nationals instead, supporting its new regulation with imposed fees and penalties that the businesses should pay in case they did not meet the required goals. As per a recent study, more than 7,000 business entities have opted out of the Saudi Arabian market in 2017. Most of these entities were start-ups and small businesses. On the other hand, the number of operating corporations and limited companies has slightly increased. In perspective, this number might not seem to be that significant in comparison to the total number of businesses in KSA, which exceeds the 450,000 businesses’ mark. However, it shows the small businesses’ weakened ability to cope with the new regulations. This is a major concern for the foreign investment in KSA which has been already enduring an all-time low level of interest in the aftermath of the oil prices crisis and it has barely started to bottom out as the oil prices started to regain their stability. Being active as it is, the retail sector has been receiving increasing interest from the Saudization policies. 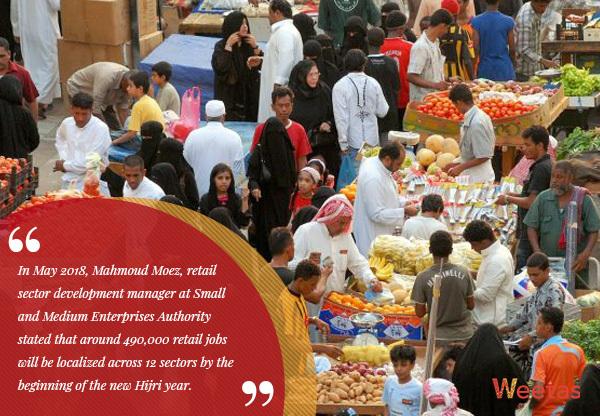 In May 2018, Mahmoud Moez, retail sector development manager at Small and Medium Enterprises Authority stated that around 490,000 retail jobs will be localized across 12 sectors by the beginning of the new Hijri year. Moez explained that the goal is to increase the retail Saudization percentage from 24% to 50% by the year 2020. He added that around 30% of the existing retail shops are expected to opt out of the market by then. This aims at encouraging the young Saudis to fill the gap by starting their own firms; naturally, this will help in reducing the impact the firms’ exodus will have on the retail properties’ market. As is the case with all theories, the implementation of Nitaqat resulted in an outcome that differs from the planned one. The concern, however, is that this difference might be greater than the optimal one. To recap, the main goals of the Saudization movement is to reduce the unemployment rate of the Saudi nationals and increase the government revenues through the levied fees that are collected from the working companies along with the expat dependent fees. 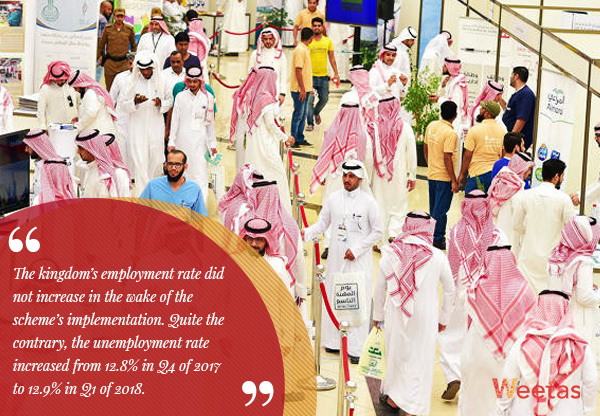 The kingdom’s employment rate did not increase in the wake of the scheme’s implementation. Quite the contrary, the unemployment rate increased from 12.8% in Q4 of 2017 to 12.9% in Q1 of 2018. This shows how the workforce gap is increasing at a rate much higher than that with which it decreases. Over the past two years, more than 800,000 expats have left; this reduced the number of expats from 8.52 million in Q1 of 2016 to 7.71 million in Q1 of 2018. However, this reduction resulted in only 43,000 new jobs for the Saudis (around 5% of the number of departed expats). 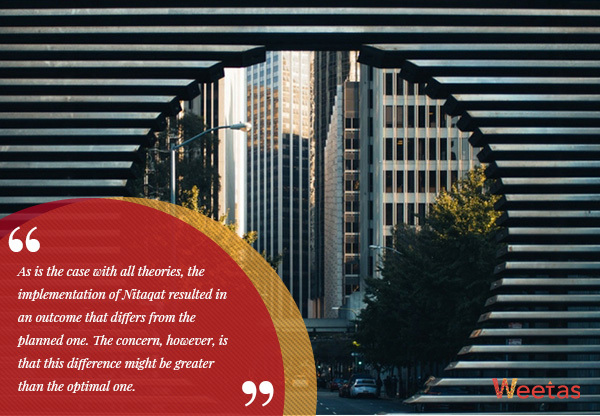 There are concerns that Nitaqat system might have focused on the quantity rather than the quality of the results. 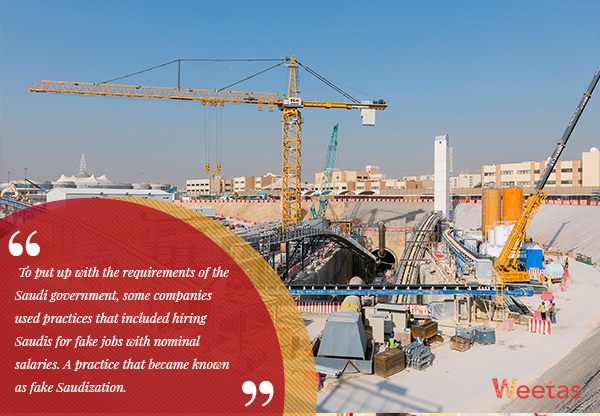 To put up with the requirements of the Saudi government, some companies used practices that included hiring Saudis for fake jobs with nominal salaries; a practice that became known as fake Saudization. In addition to that, some companies attempted to adjust the other end of the equation through increasing the prices of their products and services to pay the fees that Nitaqat levied on one hand and make up the upsurge of the expats’ recruitment costs on the other. This in turn negatively impacted the Saudis’ already weakened purchasing power. There is no doubt that the recently levied fees will help increase the governmental revenues of KSA. However, some economy experts worry that this would push expats to send many of their family members back home. This would reduce the expats’ spending in the local market and increase the outflow of capital from Saudi Arabia instead. While this fee could increase the cost of hiring an expat, it would reduce the number of nonworking expats in Saudi Arabia which will not have any direct effect on the Saudi labor market. 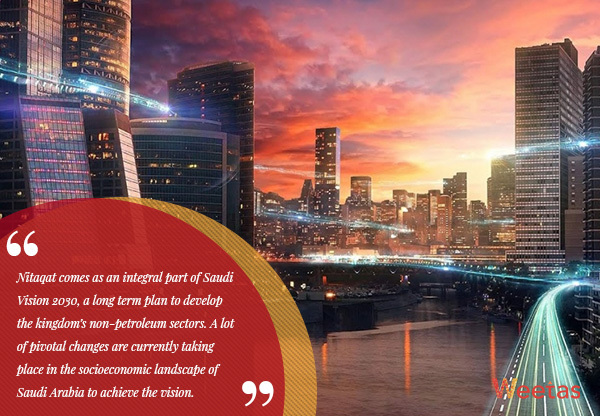 Nitaqat comes as an integral part of Saudi Vision 2030, a long term plan to develop the kingdom’s non-petroleum sectors. A lot of pivotal changes are currently taking place in the socioeconomic landscape of Saudi Arabia to achieve the vision. Most of the vision’s goals are to be achieved in the long term. This will be in line with the completion of major projects like Neom City and Qiddiya City projects. This applies to the Saudization goals as well. For this to happen, however, the Saudi government must ensure the efficiency and effectiveness of its policies. On one hand, the government needs to set up laws that prevent fake Saudization. On the other hand, it will need to develop and improve the kingdom’s citizens’ skills, education, and abilities; this way, they will be able to fill and fit within the expats’ vacant positions. Additionally, many experts urge the Saudi government to consider exempting some industries from the levied taxes and policies. These industries are crucial to help the kingdom overcome the economic crisis it is facing and achieve the vision goals. Poor execution of Nitaqat might end up backfiring at the Saudi economy, therefore diminishing its different sectors. Real estate market is no exception, of course; considering the expats’ direct effect on it and its importance, it might end up damaged rather than revitalized if the government did not apply corrective actions to the Saudization policies immediately.